Europe – a continent which, historically, has liked nothing better than all-out war – is currently enjoying an unprecedented age of stability. For 72 years it has, with the odd regional and civil skirmish excepted, been at peace. It is a golden era. But peace is not inevitable. If you think Europe can't descend into brawling like drunks at closing time again, be aware you're not the first to believe it. Some people dreamed something similar during the Concert of Europe in the mid-19th century, and again in the four decades of calm which followed the 1870-71 Franco-Prussian conflict. That second period ended with WWI. So they misjudged that. Could we also have misjudged the proximity of mass conflict in the 21st century? Some say so. Security experts are increasingly investigating scenarios where a much-strengthened Russia on one side and Europe's NATO allies on the other go from diplomatic tensions to full on slapping each other about. This, they stress, is unlikely. But if global events have taught us anything of late, it's that unlikely doesn't mean impossible. In fact, the above could happen in three worryingly simple steps. One: Donald Trump makes good on his hints and pulls the US out of NATO. Two: an emboldened Vladimir Putin decides to help himself to the Baltic states – Lithuania, Latvia, Estonia – he has long believed should be part of Russia. Three: given these states have been NATO members since 2004, the rest of the alliance – the UK, Germany, France et al – go to their aid. The result? "Hiroshimas and Nagasakis everywhere," reckoned the Russian lawmaker Vladimir Zhirinovsky when discussing the possibility last year. But could Russia and Europe really kick-off? And if they did how would that work out? Be warned: as Keir Giles, associate fellow with the UK foreign policy think-tank Chatham House, tells me, "There's not much good news." Tensions between Russia and Europe are always high. Even so, the present unease is ominous. On one hand Russia has been holding major nuclear drills for 40 million citizens, sending submarines into the territorial waters of other nations and running mock bombing missions on the edge of British airspace. Forcibly annexing part of another country, the Crimea, isn't generally viewed as good neighbourliness, either. Yet NATO isn't entirely averse to ratcheting things up. The alliance has almost 10,000 troops in countries which border Russia, while a two-week long war game featuring thousands of personnel and 50 aircraft is being held in Scotland right now. The enemy state in such rehearsals is often given a somewhat unambiguous name: the reds. It's not wildly anti-Russian to say the current administration fancies a bit of the Baltics. Putin believes these former Soviet states should never have become independent: each has a large Russian population and strategically excellent ports. He's certainly not keen on them being NATO members and sees the alliance – not without rationale – as encircling Russia. "If you compress a spring," he warned in 2014, "eventually it will snap back." With America gone, that snap back could happen instantly. "They would move on the Baltic states more or less immediately," says Giles, who is also director of the Conflict Studies Research Centre in Oxfordshire. "Putin believes Russian security requires the Baltic states under its domain. But you need to look further. It's hard to put a definitive border on how far ambitious Russians think the frontier should expand. But certainly you're looking at Poland and Finland too." 3. Internet down! Shots fired! In 2015, a study by US research institute the RAND Corporation concluded it would take just 60 hours – essentially a long stag weekend in Tallinn – for Russia to overrun Lithuania, Latvia and Estonia. Giles, however, reckons the signs would be there some time in advance. "There would be a noticeable rise in Russian diplomacy and media focusing on issues which could give rationale for an armed intervention," he says. On some pretence, such as a peace-keeping mission, thousands of troops would gather on the border. In the days before any incursion, the target's internet would be shut down or disrupted by specialist telecommunications soldiers. Power supplies would fail and cash machines stop giving money. Mobile phone and TV signals would be jammed. Perhaps most ominously, personalised texts would be sent direct to opposition officials, soldiers and citizens, creating confusion and panic. In some cases, these texts would appear to come from someone already in the recipient's phone book. "In the right circumstances, this could be enough," says Giles. "Russia doesn't need to roll tanks across a border. They can stage a coup without a military presence. Misinformation and civil disorder could lead to regime change with a client government of Moscow taking charge. That would meet Russia's security and economic objectives." And if no such regime change happened? Think hybrid warfare: all the above combined with the sudden movement of troops into the country. "We don't know how exactly an annexation would look, but Russia does practice this scenario," says Giles. "What we do know is it would be over pretty swiftly." Once diplomacy fails, the hard fact is that a US-less NATO almost certainly doesn't have the firepower to win a war with Russia. We'll ignore nuclear weapons for now and keep things conventional. Russia has more men (the reserves alone are 2.5 million strong) and hardware. As a single country, their chain of command is better streamlined. Soldiers are battle-hardened from Ukraine and Syria. After a decade of $40 billion-a-year military upgrades, its weaponry – such as the Pantsir-S1, a tank that can literally destroy cruise missiles – is superior too. It's also possible some NATO members would withdraw. In particular, Turkey, given the warm relationship between President Putin and President Recep Erdoğan. That's 600,000 men – the second biggest contingent after the US – gone. The result would be the NATO rump facing an existential decision: fight and probably lose, or, in this scenario, cut the Baltic states loose. Or, as Ian Shield, associate lecturer in International Relations at Anglia Ruskin University, puts it: "The choice would be between reneging on the treaty – which would certainly lead to the disintegration of NATO and probably, by extension, the whole European order – or participating in a cataclysmic war extending up to nuclear weapons." Rock and a hard place, basically. Let's carry on gaming, though, and say NATO engages Russia. How does that go? Not well for either side, says Shields: "On any battlefield, there would be annihilation – although these wouldn't be battlefields like we have previously known. Missiles and artillery have far greater range and precision, meaning enemy posts, infrastructure, armouries, even entire towns, could be destroyed from within home territory. What you have is less individual battles but far greater destruction. If neither side backed down, entire swathes of Europe – it's impossible to know where – would be reduced to rubble. The death tolls would be unimaginable." Britain wouldn't be safe; the English Channel has become a hopelessly outdated moat. "Russian aircraft wouldn't need to even enter British airspace," says Shields. "They could land precision strikes from well outside." Both sides would wrestle for control of the seas around Scandinavia. Cyber-attacks, meanwhile, could shut down transport infrastructure, hospitals, media and utilities. Russia's main advantage amid the carnage would be two-fold. Firstly, because it has more weaponry and men, it can, essentially, keep blasting away longer. Secondly, its sheer landmass means it could better absorb the devastation: NATO could wipe out every single structure hundreds of kilometres into its adversary's territory, and Moscow wouldn't even be scratched. As any sixth form history student knows, it doesn't matter if you have 7,000 nuclear weapons (Russia) or 200 (Britain and France); their cataclysmic qualities level things up. The thought goes that the pressing of the red button means MAD: Mutually Assured Destruction. If one side starts lobbing warheads about, the other responds in kind. Both adversaries are wiped out. Right? Wrong. "What Russia has in its arsenal which the west doesn't is tactical nuclear weapons," explains Giles. 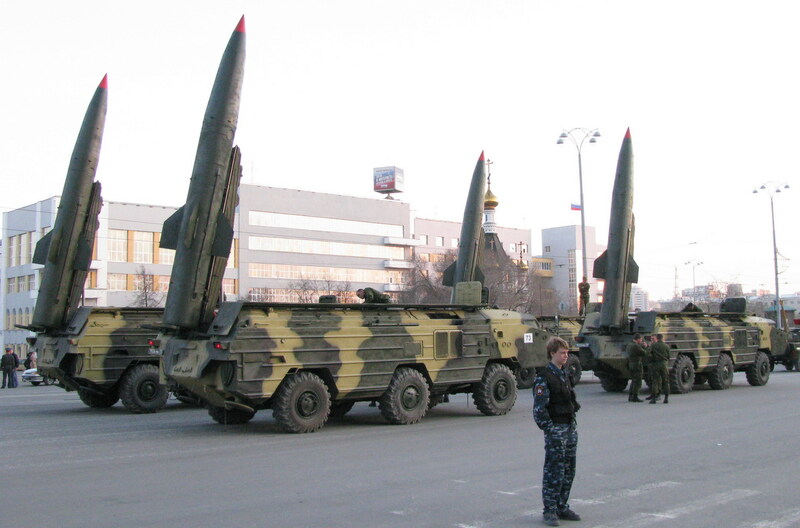 "These are not big city-levelling nukes, but ones which can destroy battlefields or neighbourhoods. The west had these weapons but got rid of them. So its only response to a tactical nuclear strike would be a full nuclear attack. Which is self-defeating because it would also ensure their own destruction. The west is missing several rungs on the escalation ladder that Russia has built into its strategy." Nonetheless, once things go nuclear, it all becomes unpredictable: cities wiped out, millions dead. At this point, even the most advanced strategists tend to stop plotting possible paths. If America leaving NATO is a gateway to Armageddon, the good news is it seems increasingly unlikely. Trump probably won't ditch the alliance. That's because it doesn't only keep the US secure; it's also politically and economically advantageous. It gives Washington influence in Europe and protects a vast and prosperous continent which – and this is important – spends much of its wealth with American companies. That said, maybe it's still worth remembering peace here really does hang by threads. Maybe go out and play more.